As someone who loves many types of art I am always interested to see and try new things, especially with wax as this is my passion as an artist. The way I paint using wax, I use a formulated wax medium which is already coloured and ready for use. I mostly paint onto a specialist encaustic gloss card. My style of painting is a light coating of wax, it has texture and sheen but is not as deep as some encaustic painting styles that have many layers of wax. There are many styles of “Encaustic Art” and a wide and varied range of techniques, each with its own unique and special use of the wax. Some are deep layered paintings craved out through the wax, others are painted with a brush, and some use mixed media techniques, using photographs and collage type styles. I do like to try new things and enjoyed my experience of working with canvas board and deep layers of wax when painting roses last year, I blogged about it “First experience of painting wax on canvas”. Art In Wax Experimenting Again! 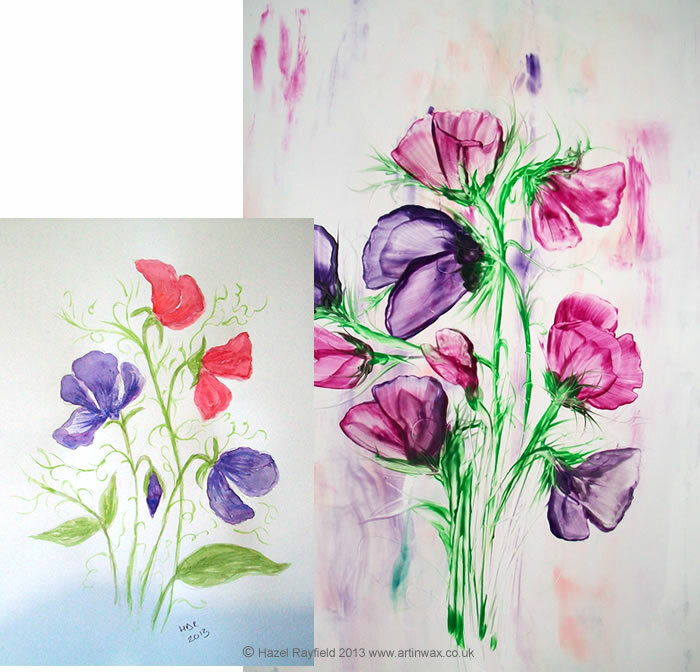 I love to experiment with wax and for a change I decided to try adding a layer of wax to a couple of paintings which are drawings in pencil, which I then painted in watercolour and added some ink pen too. I have created two pictures at an ACEO size (2.5 x 3.5 inches), I thought I would start small to see have the wax reacted to the card, which was a porous surface rather than my normal encaustic gloss card and the results are very interesting ……. 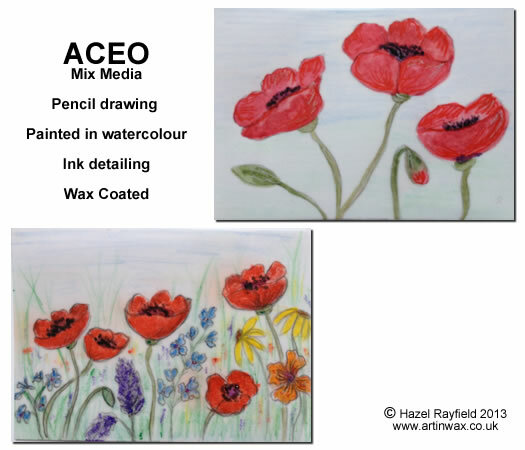 I don’t draw onto my card when I am painting an encaustic painting, I do sometimes make stretches to work from but mostly I paint free hand and from my imagination when using wax, so this is a different way of working with wax for me. As you can see from these ACEO pictures I have pencil drawn my subject I then painted in watercolours, and using some coloured ink pens define some of the lines a little to give a drawn effect. In the meadow picture the lines enhence the rustic feel of the drawing and for the poppies the ink gives depth the the petals I feel. Once totally dry, I left them overnight, I used clear wax medium and coated the pictures in the wax using a heated iron tool, which fused the wax to the picture. The paintings now have a wonderful shine now they have had a light polish and yet the colours of the watercolour are still bright as they were before, they have a very slight texture.